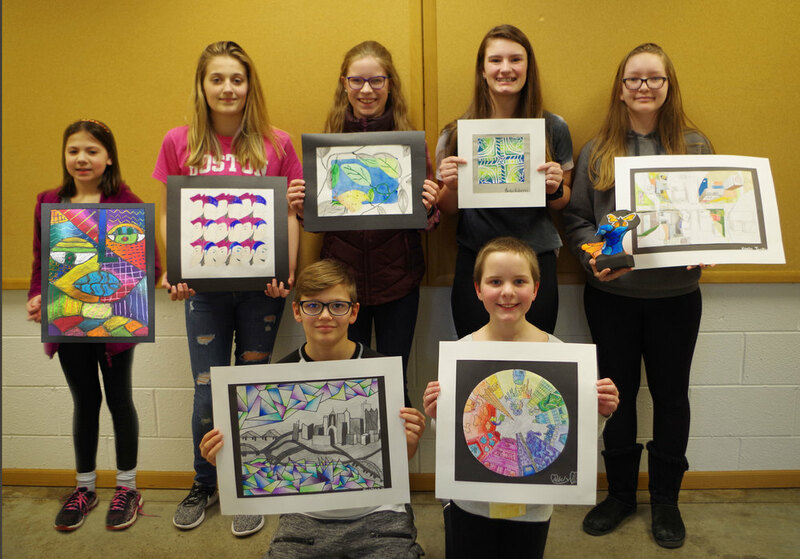 Congratulations to the Pecatonica Community Middle School artists for their color infused works of art being selected to be on display at the Rockford Museum’s 78th Young Artist Show. The students used a variety of mediums such as crayons, colored pencils, Sharpies, Chalk Pastel, Glue India Ink, and Ebony Pencils to draw, outline, color and fill in abstract art, opposite design elements, symmetry in nature as well as three-dimensional cityscape pieces including a nature-themed sculpture. The Art Show will be held April 14 - May 5, at the Rockford Art Museum. Artists From Left to Right Bottom Row: (7th) Jonathan Hartline, “The City at Night” and (5th) Adelyn Howald, “Rainbow Randomness”.